From the Prince Rupert ferry terminals and train station follow the four lane Highway 16 to McBride Street where you must turn in front of the Courthouse grounds. Turn LEFT one block to the end of McBride Street, then RIGHT down the hill to Cow Bay Road on the waterfront. 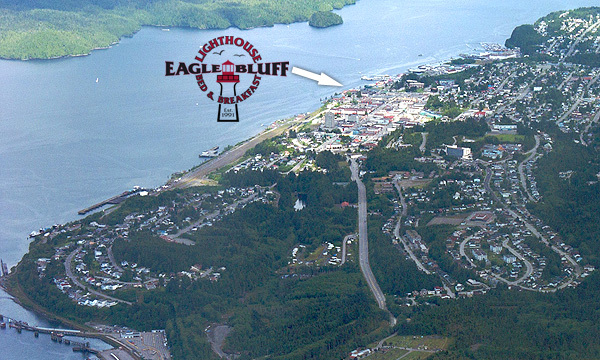 Two blocks brings you to the Atlin Market and parking area and Eagle Bluff Lighthouse Bed and Breakfast beside the wharf in Prince Rupert. If you are driving in on Highway 16 make a right turn at the traffic lights on 3rd Ave & McBride St., 2 blocks until it becomes Cow Bay Rd. and 2 more blocks to the wharf & Atlin Market. Prince Rupert is a beautiful city year round. Please view our photo gallery of images.